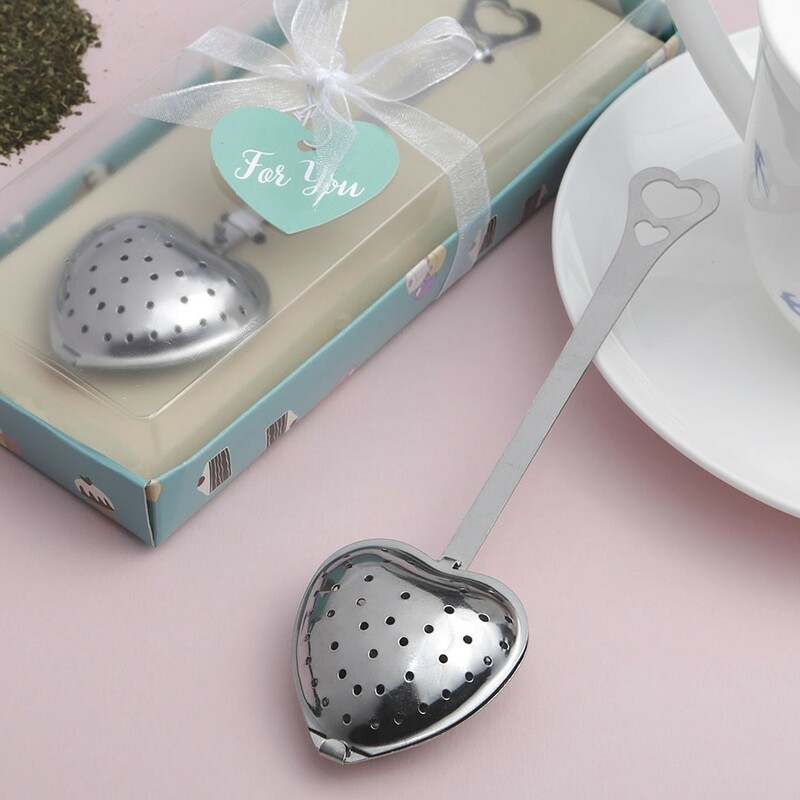 Bring a touch of romance to your garden tea, high tea, special event or grand celebration with these adorable heart shaped tea infuser favors. The tea infuser is made of sturdy stainless steel with a silver metal finish. The infuser has a long handle, ideal for stirring and is decorated with two cut-out hearts at the top. The infuser has a clip on heart shape to insert the tea bag. The heart opens with a flip style latch. Place into your cup of hot water or tea pot and stir for a romantic cup of tea! This great tea themed favor comes packaged in a seafoam box decorated with adorable edibles. The box has a clear acetate top and is wrapped with a white organza ribbon and bow. Attached to the bow is matching heart design 'For You' tag. Size 5 1/2" long x 1 1/2" wide Made of Stainless Steel with a silver finish Long handle for stirring with cut-out heart design on top Clip on heart shaped infuser opens with a flip style latch to insert the tea bag A great tea themed favor!